While we can all be glad a trip to Australia no longer means spending weeks at sea, long-haul travel still has an uncanny ability to make us resemble our passport photos. Long flights connecting to other long flights, are hard work for any traveller, but they do offer an opportunity to taste-test new destinations. These are my favourite stopovers between Europe and Australia. During the time I have been living in Australia I have made several trips to Europe and explored lots of other destinations on the way. I have made a conscious effort to enjoy stopovers in different locations on each trip. While I don’t have a lot of airline loyalty points with any one group, I’ve definitely enjoyed some great stopovers! With an interesting history, Singapore is a fascinating and dynamic city. It is also compact, making it easy to enjoy a lot of what the city has to offer in just a short trip, perfect for a stopover. Learn about life for the early Chinese settlers at the Chinese Heritage Centre in Singapore’s Chinatown or about Buddhism at the Buddha Tooth Relic Temple. Little India is awash with colour, both in the array of religious offerings and other items for sale, and in the amazing artwork that adorns the Hindu temples that line Serangoon Road. Malaysian district Kampong Glam and Arab Street offer the Malaysian Heritage Centre, the Peranakan Museum, bazaars, and cafes offering alfresco dining and shisha pipes, all within a stone’s throw of the historic and golden-domed Sultan Mosque. Singapore’s colonial days can also be revisited at Raffles Hotel, where you can sip a Singapore Sling in the Long Bar, and imagine Hemingway sitting there beside you. Other examples of Singapore’s architecture will seem utterly futuristic in comparison. Marvel at the spaceship-like courthouse suspended above the north shore of the Singapore River, and the impressive Marina Bay Sands towers that guard the bay. While a little less well organised than Singapore, Malaysia’s bustling capital is nonetheless a dynamic centre in it’s own right. 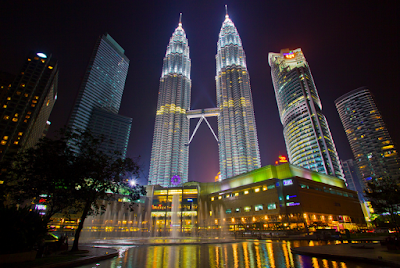 Kuala Lumpur is a shopper’s paradise. At the very centre of the city is the bustling Bukit Bintang neighbourhood, where the streets basically serve to connect malls. An amazing array of street foods is also available offering an inexpensive way to try local barbecued meat, seafood, noodle dishes and desserts. The Central Market sells a variety of locally made handicrafts. Kuala Lumpur’s iconic Petronas Towers rise majestically from another mall, and a revolving restaurant at the top of the Kuala Lumpur (Menara) Tower offers panoramic views across the city. The Islamic Arts Museum is a treat for culture vultures, as are the Batu Caves, which are home to several Hindu temples (and monkeys), and just half an hour from the centre on a direct train. Bangkok is the city of Buddhist temples (wats). The most famous of which is Wat Pho with its giant golden reclining Buddha (check out his mother-of-pearl inlaid feet), but it is also often the busiest. For more intimate temples, head to Wat Phra Kaew (Temple of the Emerald Buddha) or Wat Ratchanatdaram (Temple of the Royal niece) which has very distinctive black spires on the exterior. Banglamphu is still going strong and Khao San Road continues to offer everything from fresh pad thai sold from street vendors, to wacky souvenirs and Tiger Beer T-shirts. Daytrips west from the city to Kanchanburi, to see the bridge over the River Kwai, and to the traditional Damnoen Saduak floating markets are interesting, if you have time. While fewer flights go through Bangkok, Thailand is a less expensive destination than Singapore or Malaysia, so your money will go further in Bangkok. Neighbouring China, Hong Kong is one of the most densely populated regions in the world. With an impressive skyline featuring more buildings over 150 metres in height than any other city, Hong Kong’s progressive attitude is clear. Take the tram up to Victoria Peak for sweeping views across the city. You can also admire the skyline while sailing a junk in Hong Kong’s harbour or make like a local and catch a ferry to Kowloon Island. Practice your bargaining skills at the Temple Street Night Market, where you can buy just about anything, including street food, and you can even have your fortune told. For a break from the bustle of the metropolis enjoy the serenity of visiting the enormous Tian Tan Buddha on Lantau Island. Hong Kong is a vibrant modern city and there are hints from its time as a British colony woven in with the territory’s Chinese roots. Boasting to have the biggest and the best of everything, Dubai makes a great destination to sample a taste of the Emirates. Glitzy modern architecture is a feature of the city. Dubai boasts the world’s tallest building. Burj Khalifa is over 800 metres tall (and the world’s fastest lift will take you to the top in seconds). While Burj Al Arab - the luxury hotel that resembles a blowing sail, which at over 300 metres tall is not small either, claims to be the most photographed. The Sheikh Mohammed Centre for Cultural Understanding is a great place to learn more about Arab culture. Tour operators run desert safaris, on which you can learn about Bedouin culture, smoke shisha and overnight at a Bedouin campsite in the desert. For a glimpse at what local life used to be like, venture into the Al Fahidi historic district, or get a taste for it while practising your bargaining in one of the many souks. The names are pretty self-explanatory, the gold souk sells jewellery, the spice souk: spices, the perfume souk sells Arabic and international perfumes and fabric and clothing can be bought at the textile souk. If you feel the need you can even ski in Dubai on the artificial slopes, complete with mountain café, in the Mall of the Emirates. Have you got a favourite stopover destination that is not on this list? Please tell us about it in the comments below.